Fall is definetely peeking around the corner and my recipes are changing as the temperatures drop. My daughter and I generally go to our local farmer's market every Saturday morning. Sometimes I have a general idea of what I'm want/need but today we just wandered. I wanted a basket of groundcherries but felt too stingy to pay the $4.25 they were asking. I used to pick them up for free from my grandmother's garden and I love them but if I bought that little basket I would have to make a pie and I already had a lot on my plate for today. We did buy a beautiful pumpkin to put at our fairy tale door-it seemed like the right time since we both had to wear our fleeces to the market and leaves swirled around us as we shopped. My daugher wants me to eventually to turn it into a pumpkin pie. I just let her be excited about the seeds we will scoop from the insides and didn't get into how pies come from a smaller pumpkin. I did do some serious cooking though as I had an beautiful eggplant staring me down from last week's FM. I don't like to leave fresh, delicious produce sit in our veggie basket for that long but we've had a busy week and well, there sat the eggplant. I looked through a few of my trusty recipe books for something different but didn't find anything that stole my heart and begged to be cooked so I went back to my trusty eggplant standby-which seemed like it was calling my name anyway! I've made this recipe for the first time like 9 years ago and probably make it 5-6 times a year. If you ever were to come and visit-this is probably the recipe I would cook for you. This recipe demonstrates my love of cooking, which sits just an 1/2 inch behind my love of reading. The Healthy Kitchen; Recipes for a better body, life and spirit written by Andrew Weil, M.D. and Rosie Daley hold within its pages this trusted recipe which I share with you tonight. Once again the five of us around the table left happy and full. This book is so well-loved there is a break in the spine, right about where this recipe is listed! 16 blanched plum tomatoes or 28 ozs canned peeled whole toms. Make the marinara sauce first: Saute the onion, garlic, and carrots in olive oil in a medium saucepan over low heat for 3 minutes. Add the red wine, oregano, and basil, and cook for an additional 5 minutes until the wine is reduced by half. Add the tomatoes, mushrooms, honey, salt and Italian Seasoning and continue to cook until the mushrooms become limp, about 15 minutes. Broil the eggplant: Brush both sides of the eggplant with olive oil, salt, little bit of cayenne and lay on a baking pan. Broil for 3 minutes on middle rack under the broiler until it turns brown. Remove from oven and let cool. Prepare the spinach: Steam the spinach for 1 minute in a pot filled with 1/2 cup purified water. Remove from heat and let cool. Squeeze the spinach, using clean hands, to remove excess water. Put softened goat cheese or ricotta in a medium bowl. Add the cooked spinach and mix together thoroughly with a fork. Put the olive oil, onions and sliced garlic in a small saute pan over low heat. Saute for 2 minutes until the onions turn light golden brown. Remove from heat and cool. Add it to softened cheese and spinach mixture. Add the pepper and the fresh basil and mix together. Preheat oven to 375 degrees. Assemble lasagna: Cover bottom of 13 X 9 inch baking dish with 1/2 cup of tomato sauce. Lay 4 sheets of the oven-ready noodles on top. Spoon the spinach filling over noodles and spread it around. Lay 4 more sheets of noodles on top of spinach. Lay eggplant slices length-wise over the noodles. Sprinkle the mozzarella on top. Pour 1 cup of marinara sauce over the cheese. Lay another 4 sheets of noodles over the sauce. Slowly pour the water over the lasagna noodles. Pour the remaining marinara sauce on top. Sprinkle the top with remaining mozzarella cheese and olives. Cover with foil and cook for 1/2 hours in the oven. When it is completely cooked, remove from oven and let cool for 5 minutes-or longer, it lets everything set and juices to absorb. Cut into squares and eat. Okay, I know it sounds like a lot of steps-and it is, but so well-worth it. What's funny is the recipe actually includes a white sauce, which I have made exactly once and none of us thought it added to the flavor thus making it not worth the time to make it. If anybody is a white sauce fan, let me know and I will email the recipe to you. I have tweaked this recipe quite a bit over the years but I've given you the true recipe. I love eggplants-they have such a intense color! This recipe is perfect on a just-about-fall-table, as a potluck dish, or as a I-love-you family treat. What about you? Did you shop at your local farmer's market? Did you cook with any vegetables today?? What was it? 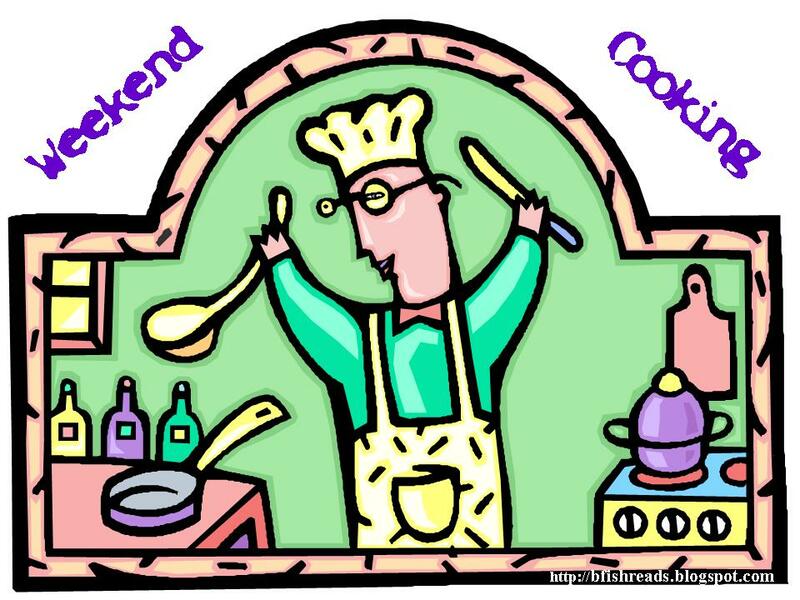 This post is part of Beth Fish Reads for Weekend Cooking. 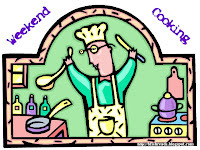 Head there to read an excellent cookbook review as well as a list of other Weekend Cooking participants. I hope you might try this delicious eggpland dish-just to try something different. There is something so wonderful about making this from start to finish; all from scratch.